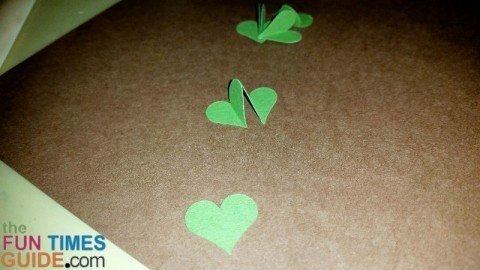 I’ll show you how to create this sweet shamrock from 6 little hearts, and give you some easy-to-follow instructions so you can make your own Shamrock St. Patrick’s Day cards this year! My 3D clover card was inspired by this one. 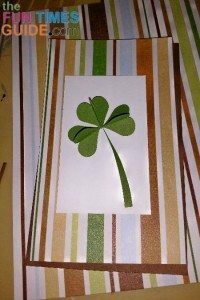 I didn’t have any double-sided paper, so I just used a scrap of olive green cardstock to make the clover leaves. There are some great packages of double-sided paper out there — like this one — so look around if you happen to like that style. A fun read: What’s the difference between a shamrock and a clover? Start by making 6 hearts all the same size. Mine are 3/4″ and I cut them on my Cricut Expression (using the Plantin Schoolbook cartridge, roly poly setting). You can easily cut yours by hand, trimming them all to be the same size. Or use a heart punch. Obviously, smaller hearts will more closely resemble a real clover, but you can choose any size you like! Next, fold a crease down the middle of each heart. I folded mine against a credit card because it’s challenging to hit the middle on such a small heart by simply folding them by hand. 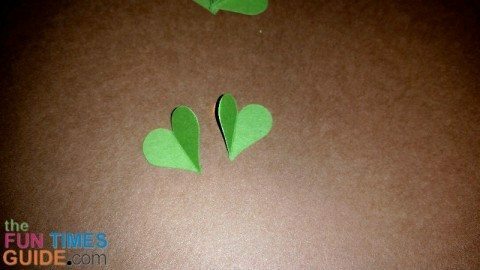 Combine the heart shapes to make a shamrock. 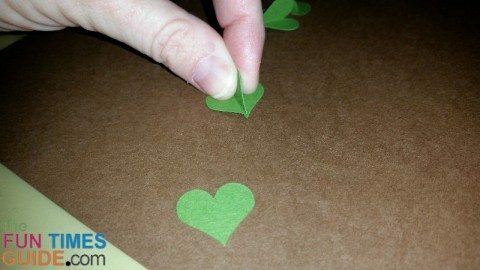 I used Tombow double-sided tape to make my own double-sided clover petals. You can see how using double-sided paper would have a nice effect. Cut a snip of the green paper to make the stem. Attach it at an angle to a piece of white cardstock (2″ x 3.25″). Place one petal at the top of the stem, then one of the other petals off to each side. Using black ink, stamp the sentiment onto white cardstock (2″ x 1.25″). I used the “Happy St. Patrick’s Day” stamp from Hero Arts Celebrate Everyday PolyClear stamp set on my Clear Acrylic mounting block by The Paper Studio. TIP: This was my first time using the clear, mountable stamps, and there is a bit of a learning curve. It helps to line the stamp on the grid lines of the block, and practice a couple of times on scrap paper. I put the stamp in one of the corners — thinking it would be easier to manage from there — but it was actually easier to place it dead center on the block. That makes it easier to apply even pressure over the entire stamp. Make the card base using brown cardstock (5.5″ x 3.25″ with a vertical fold). For my shamrock card, the front and the inside panel have each been given a layer of striped paper with more masculine colors: browns, tans, and greens. (This card is for my brother.) 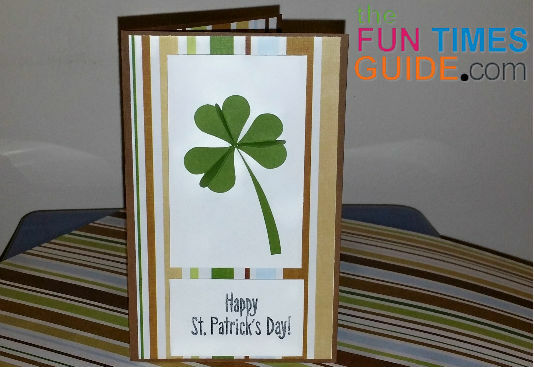 You can compliment your shamrock with colors to suit your personal taste or your own plans for the card. Attach pop up squares (or dots) to both white pieces — one with the clover and the other with the sentiment. Center them as shown. You could also put just the clover on the front and save the sentiment for the inside. The inside of my card has a plain white block of paper (2″ x 3.25″) for a handwritten message. 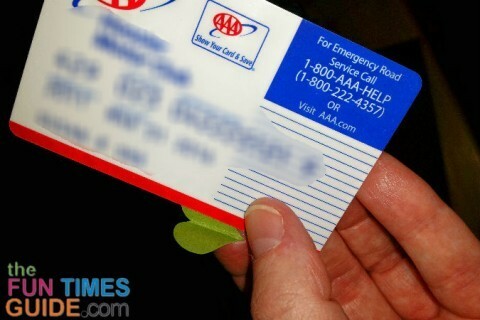 First, as you can see from the side view, there is some thickness to this card. It should be okay to mail through regular postal service, but if you have any concerns you can take a sample there for them to test ahead of time. If there’s a problem, you could eliminate the pop up squares. You will need to gently fold down the part of each petal that stands up. Don’t actually fold and crease the petals — just fold them down so they fit well in your envelope. Speaking of the envelope, I used this method to make a matching envelope using the same sheet of brown/green striped paper. Well, have fun making your St. Patrick’s cards, and I wish the luck o’ the Irish to ye! I’ve been crafting for many years. I started with cross-stitching, then moved on to wearable art, projects with painted wood, fabric crafts, and paper crafts — which has transformed primarily into card making. I also do some rubber stamping and scrapbooking, but mostly I enjoy creating handmade, one-of-a-kind cards.